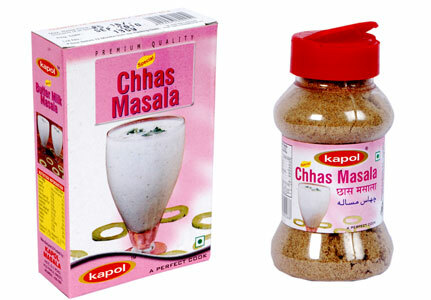 Rock Salt, Common Salt, Cumin, Mango, Kachri, Black Salt, Black Pepper, Dry Ginger, Fennel, Tuj, Clove, Chilly. Add one tsp. of KAPOL BUTTER MILK MASALA to a glass of cold Butter Milk. It enhances the taste, helps in digestion and gas trouble. (Add salt as per taste).